- Break repetitive patterns of self-sabotaging behaviour? - Express yourselves more freely in your intimate relationships? - Communicate more effectively at home and at work? - Enhance your confidence and self-esteem? - Support your physical and emotional wellbeing? - Access untapped sources of energy and creativity? On this web-based program you will learn a simple, safe and powerful tool called Voice Dialogue that will enable you to deal with the issues that cause you disruption and stress. The result is clearer and more considered choices in all areas of your life. Participants are eligible for discounts on Voice Dialogue UK workshops and private sessions! We're all made up of many different "selves" or parts - some we know well, while others we keep hidden in the shadows. 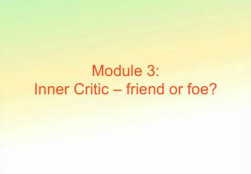 On this 7 module Voice Dialogue Online Program, you will meet some of your inner cast of characters - for example, your Pusher, Pleaser, Perfectionist and Inner Critic. You'll discover the influence that each of them has in your life as well as the gift that every one of them brings. Understand the influence your Inner Critic has on your life. Find out how to increase your confidence and self-esteem.